These scissors are self-opening. They work well for someone just learning to cut or persons with reduced strength. Lightweight continuous loop plastic handle sheers. Gently squeeze the thumb and fingers for operation. Automatic opening when the pressure is released. A blade guard is supplied for safety when the scissors are not in use. Similar to the style listed above #7029 with an additional spring, which opens the scissors when pressure is released. All the features of #7022 plus greater control when using the long loop. Persons with limited movement can place fingers outside of the loop. These scissors allow the strength of the total hand to cut while maintaining control. 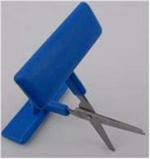 These scissors offer stability as the scissor is fixed to a wooden base, which has non-slip pads. The scissor is operated by depressing the large "T" shaped handle. The spring automatically reopens the scissor after completion of cutting action. Bladeless cutting, simply pull the paper, card or acetate through the cutter for smooth lines. No visible sharp edges, makes this tool extremely safe. The handle design allows for use with the left or right hand. Depress the "T" Handle with the scissors in a stable position or scoot them across the table to cut. A traditional look, with self-opening action when pressure is released.